During the hot and sunny summer of 2014 the independent transport videos cameras paid a visit to south Wales and in particular the capital city of the principality, Cardiff as well as the busy town of Newport. We start our journey in Cardiff where the main bus operator is Cardiff City Transport Services Ltd, who’s vehicles are branded as ‘Cardiff bus’. The fleet is very well maintained and carries a smart deep aqua green and orange livery. A number of the older vehicles in the fleet, mostly Dennis Darts still carry the older dark green, orange and cream livery. However, there are some branded liveries such as ‘The Bay car’ and ‘Capital city Green’ to add further variety. The fleet is very modern with brand new Mercedes-Benz Citaros as well as a large fleet of Scanias with both Scania and Wrightbus Solar bodies representing single deckers and double deck Scanias with East Lancs Olympus bodies. There are also nineteen articulated Scania single deckers in the fleet. Dennis and TransBus Darts with Pointer bodies are in abundance as well as twelve ADL Enviro 300s. Our filming takes place in the city centre in over ten different locations. Starting in St Mary Street we include Westgate Street and Wood Street outside of the bus station where we also see some of the operations of Stagecoach, National Express, First, and vehicles from Newport Transport operating on the busy competing service between the two towns. Other locations include Duke Street and Kingsway to name but a few. After a busy day our filming concludes outside Cardiff Castle. We then have some archive video for you to enjoy. Taken in Cardiff bus station in 1990 we see one of the then brand new Optare Metroriders as well as a Bristol VR and a Leyland National from the Red & White fleet. Our attention now turns to Newport. We start with some archive video of the old bus station in 1992 featuring Newport Transport buses, Red & White and a number of independents going about their business. Then after a brief visit to the Corporation Road bus depot in January 2007 we bring the story up-to-date with our visit in September 2014 showing the current fleet in operation. 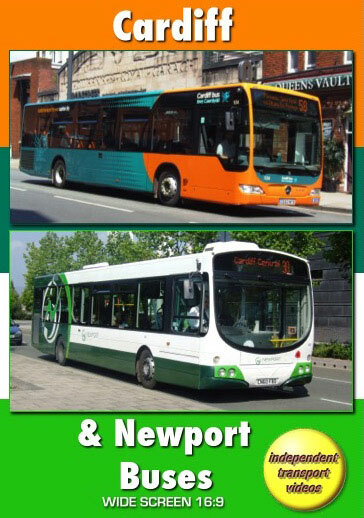 Like Cardiff, Newport Transport Ltd., branded as ‘Newport Bus’ is a very smart and modern fleet. The newest double deckers are five Enviro 400s in the latest livery of mid green and white with a yellow flash. Older vehicles wear a dark green and white livery, some with a stylised logo. There is a large fleet of Scania OmniCity buses as well as Alexander ALX200 Dennis Darts. Other double deckers include ALX400s and two Plaxton Presidents previously owned by Metroline. Our filming takes place around the town centre and includes Emlyn Street, Skinner Street and Clarence Place. Our cameras then move to Chepstow, where Newport Transport operates the local services with some of the buses branded as such. We hope you enjoy the action on this DVD programme! Duration : 75 minutes (approx).